[PDF] Menus from History [2 volumes]: Historic Meals and Recipes for Every Day of the Year | Free eBooks Download - EBOOKEE! 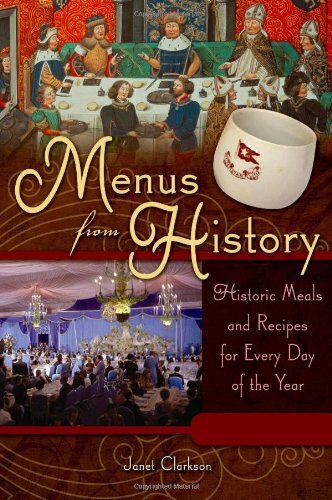 Description: Menus from History: Historic Meals and Recipes for Every Day of the Year offers a fascinating exploration of dining history through historic menus from more than 35 countries. Ranging from discussion of a Roman banquet in A.D. 70 to a meal for former South African President Nelson Mandela in the 1990s, the menus offer students and general readers a thoroughly delightful way to learn more about events and the cultures in which they occurred. Royal feasts, soldier grub, shipboard and spaceship meals, and state dinners are just some of the occasions discussed. Arranged chronologically, each entry covers a day of the year and provides a menu from a significant meal that took place. An entry begins with the name, location, and date of the event, plus a brief explanation of its significance. Next comes the menu, followed by an analysis and, where possible, several recipes from the menu. No comments for "[PDF] Menus from History [2 volumes]: Historic Meals and Recipes for Every Day of the Year".